Best online slot machine - Daredevil! Daredevil is what every slot should aspire to be. It mixes the best elements of newer and older slots in creating a game that is very easy to learn, has a number of bonus features and adds its own unique touches without overloading gamers with difficult-to-understand bonuses and over-the-top graphics. Sporting 5 reels and 20 paylines, this video slot is well designed and all the symbols on the reels are dramatically highlighted against a dark background. 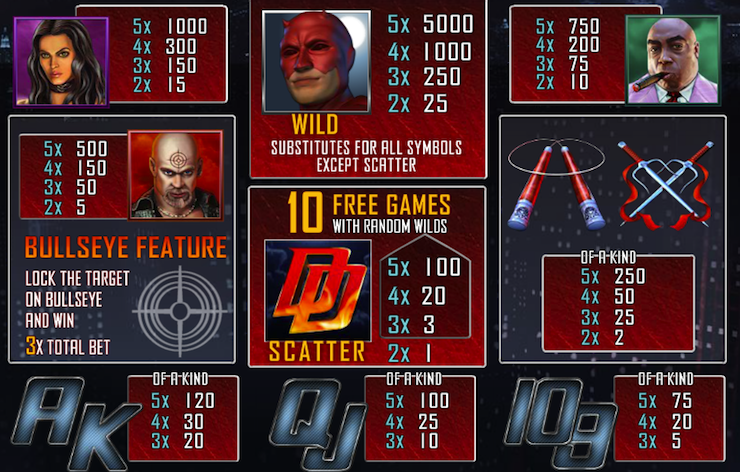 Daredevil himself is the Wild symbol and triggers one of the best features of the games, the Free Spins bonus round, where Daredevil uses his special Radar scanner on every symbol to reveal any hidden Random Wilds which will boost your payouts dramatically. Another unique feature in Daredevil slots game which we love, is the Bullseye Feature, giving a totally unique spin on regular slot games, where you aim before every spin, giving you extra chances to win, and a great element of control that takes you outside the slot game itself. With huge payouts just waiting to be won, don’t forget about the all-important Mystery Progressive Jackpot – unique to all slot games in the Marvel Slots range.